Shear Madness is a celebration of all costuming genres. We were so pleased and proud of the wide variety of fabulous costumes our members submitted for this challenge! We had historical pieces, fantasy pieces, artistic re-imaginings, and mash-ups galore. In fact, we had so many fabulous entries that the judges decided to award prizes in 3 separate categories: Anything Goes, Historical, and Character! The costumes in this category hit the challenge theme right on the nose! They display unique, personal character designs in a variety of genres. These folks let their creativity run wild and we love it! The costumers in this category took us on a whirlwind adventure in a time machine! By working with the trending styles of their chosen eras, they were able to pull off some fabulous displays of fine tailoring, color choice, and design execution. The costumes in this category perfectly portray colorful characters both from pop culture and from the artist’s own imagination. The judges decided the following entries deserved special recognition for their total embodiment not only of the challenge theme– ANYTHING GOES– but also for their overall craftsmanship, design, character, and vision. Thanks to all the wonderful entries we received for Challenge #16! A big thanks to our panel of Challenge #16 Judges as well! The judges for this round are all founding members of the original “Shear Madness: The Joy of Impractical Costuming” Facebook group back in 2013. Leah Lloyd of Lamia Creations has been making costumes since the ripe young age of 4, when she wrapped a bunch of scarves around herself and shuffled out to the living room where her mother was watching the classic Mummy. It’s been downhill since then, including receiving a degree in Costume Design, a Clothing/Headwear Laurel in the SCA, and winning “The Way You Wear Your Hat” Shear Madness Challenge. And someday she will cull the fabric hoard in the attic. Really. Artemisia Moltabocca is a 50+ year old costumer with no plans of slowing down. The last competition she entered was at the Steampunk Worlds Fair where her Dalek Queen won Best Maker / Individual, and 2nd place Best Costume. Right now she’s working on restoring a 1911 Singer sewing machine, and recreating vintage clothing from the 40s and 50s. Find her on Costumingdiary.com! Laura Ulak is the founder of Shear Madness and co-founder of the MN Society of Costumers. She has been costuming for over 20 years, and has costumed everyone from bearded Santas to Drag Queens to Ren Fest Queens. She is a Master’s level award winning masquerade costumer. She currently spends her spare time outfitting high school students for fall plays and spring musicals. She learns something new everyday at Shear Madness, and loves the supportive environment of people who remember the fun in costuming. Challenge #15 “UPDO” was about wild, wonderful WIGS! The entries all displayed plenty of creativity, research, and thoughtful construction! 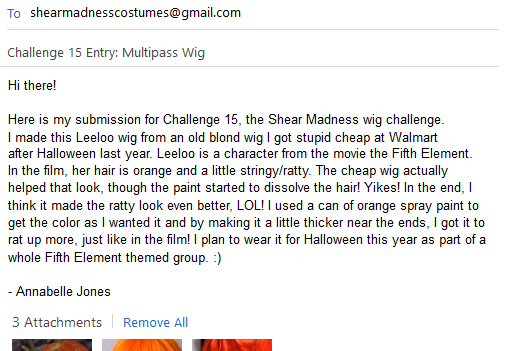 Shear Madness certainly has some very talented wig wrangler in our midst! The judges also decided the following entry deserved special recognition for its historical accuracy, personality, and fine craftsmanship. A big thanks to our panel of Challenge #15 Judges as well! Amanda Fineran has been making her own costumes since she was in high school and specializes in Star Wars, kids costumes, and leathercraft. She won 3rd Place in the Shear Madness Adorable Alert Challenge with her daughter’s Willy Wonka costume. Amanda is also a member of the 501st Legion and Rebel Legion – organizations whose members create screen accurate Star Wars costumes and wear them at parades, events, and hospital visits. She is also President of Costumers for a Cause – an organization that helps connect the costumers with the people who need them. Kendra Van Cleave is a fashion historian, academic librarian, and costumer based in the San Francisco Bay Area. She has studied and recreated historical costume for nearly twenty years, currently specializing in the 18th century. She has master’s degrees in history and librarianship, and publishes scholarly research on the history of fashion. Her reproduction historical costumes have won multiple awards. Kendra has taught numerous workshops on the history and how-to of fashion and costume, including 18th century wig styling, primarily for the Greater Bay Area Costumers Guild and Costume College. She is available for workshops and lectures on 18th century costume and 18th century wigs/hair; to consult on film, theater, and living history projects; and also makes custom 18th century wigs on commission. Her book “18th Century Hair & Wig Styling: History & Step-by-Step Techniques” is available on her website. The 14th Quarterly Challenge is over, so it is time to start thinking about the next one! 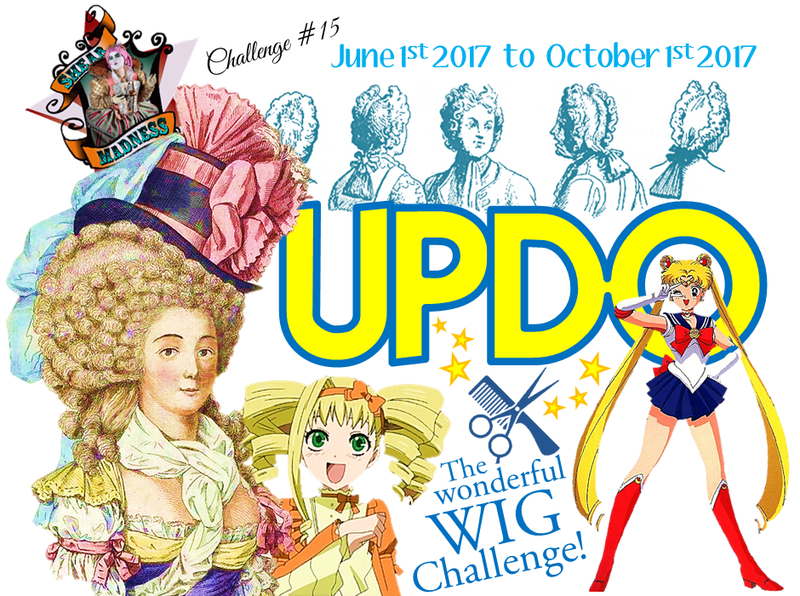 Challenge #15 is the “UPDO” Wig Challenge! This is for all you crafty wig wranglers! Anime, historical, anything goes. Enter your amazing wig transformation here! The submission deadline is ****October 2nd, 2017**** at midnight CST. 1. The submissions window opens on July 1st, 2017 and closes ****October 2nd, 2017**** at midnight CST. Any wig/hairpiece finished within the last year qualifies. When you began your piece doesn’t matter as long as it was FINISHED within the time period of 7/1/2016 – 10/2/2017. 2. This challenge encompasses all sorts of genres– fantasy, cosplay, vintage, historical, etc. Creative materials are welcome! Wigs with attached accessories will be considered, but this is not a hat or headpiece challenge. The focus is on the wig: styling, materials, and character portrayal/research (if applicable). Recreate a look from your favorite TV series or historical portrait, or design a completely unique piece of your own! 3. 75% of the piece must be made or modified by you. 25% of your entry can be unaltered/purchased items. We want to see your creativity and hard work on display, not someone else’s! Recreations of fashion plates, paintings, digital artwork, etc. are perfectly fine, but if you do reinterpret or take inspiration from someone else’s previous design, please give proper credit to them in your submission description. If you recreate a character’s hairstyle from a show/artwork, please include the character’s name and the title of the show/book/artwork in which they appear! Submissions must include Your name, a TITLE for your entry, Up to 5 PICTURES, and a DESCRIPTION. PHOTOS: Photos are VERY IMPORTANT and can make or break an entry! Wigs can be displayed on forms, mannequins, wig stands, or modeled by a person. Make sure you have at least one straight-on front shot so all the details can be seen! Include close-ups of specific details you are proud of like embellishment, process photos, texture, how it looks with the whole outfit, etc. Special note for this challenge: You may include a copy of your inspiration image without counting it towards your five photos. For example, if you created a wig for Jessie from Team Rocket, you may include a picture of her + your five photos. Please include the source of your photo, such as the artist’s name or a link if you got it from the internet. Be sure to give credit to any artists if you chose to reinterpret their artwork! The judges will review the entries and the winners will be announced during the first week of October 2017. There will be 1st, 2nd and 3rd winners, as well as honorable mentions as chosen by the judges. Winners will be given a Shear Madness logo with their winning placement for display on their blog/website and will have their creations featured in the header on the Facebook group page from October 2017 to January 2018. All submissions will have a photo featured on the Challenge’s final blog post! NOTICE: Due to a widespread Charter Spectrum internet service outage affecting a large portion of the Southeastern US, Texas, California and many others across the country on October 1st, the deadline for this challenge has been changed from October 1st to October 2nd to allow everyone in the affected an opportunity to enter! Challenge #14 “UNDER IT ALL” was about the foundation garments whose greatness is usually hidden under other layers: corsets, chemises, petticoats, bloomers, and more! The entries for this challenge were all fabulous, displaying creativity, research, and clever problem-solving! Second Place: “My 18th Century Sewing Adventure” by Marika Brimacombe! “I started this project as a video series back in May of 2015 but after a surprise pregnancy had to put it on hold for a while. After giving birth to my daughter I started the project up again and after 2 years I finally finished the Undergarments!! First Place: “Symington Corset” by Michelle Fitzgerald! Honorable Mention for Creative Trimming! “I started with the corset from Simplicity’s Tardis pattern, shortening and modifying it to meet my needs…It is embellished with lace and metal, including a serpentine zipper pull. I used black fringed lace for the upper and lower trim. I was able to machine sew the upper and lower edges of the trim, but all the long fringe pieces had to be sewn in place by hand. The trim on the center front and the straps is the same lace with the fringe removed. The corset shoulder straps hold hardware that is both decorative and practical, as it allows for the costume cape to be worn back on the shoulders as an alternative to wearing it closed at the neck. It also sports a metal swivel hook hanging just below the right hip of the corset to attach a bag to. Honorable Mention for Unique Engineering! A big thanks to our panel of Challenge #14 Judges as well! Jennifer is an artist and seamstress who is obsessed with fashion history. She tends to focus on the Renaissance through the mid-20th century styles, but sometimes dabbles in fantasy costuming and modern sewing as well. You can see many of her fabulous costumes on her blog, Festive Attyre! Leah Lloyd has been making costumes since the ripe young age of 4, when she wrapped a bunch of scarves around herself and shuffled out to the living room where her mother was watching the classic Mummy. It’s been downhill since then, including receiving a degree in Costume Design, and a Clothing/Headwear Laurel in the SCA. And someday she will cull the fabric hoard in the attic. Really. Thanks to all the wonderful entries we received for Challenge #14! We look forward to seeing what you have in store for Challenge #15!